Shortly after winning the 100 meter semi final, Usain Bolt delivered another crowd pleaser by stopping an Interview with a Spanish TV reporter to pay respect for the U.S. National Anthem as Sanya Richards-Ross was receiving her gold medal for winning the women’s 400 meters. 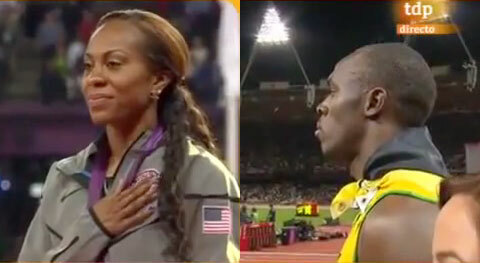 The national Anthem was playing for Sanya Richards-Ross, the winner of her gold medal in the 2012 women’s 400 meters. Out of respect, Bolt turned away from the camera and the interviewer in order to face the flags. As soon as the anthem stopped, Usain turned around and finished the interview with the Spanish reporter. Usain Bolt, considered the fastest man alive, won the 100 meters gold medal with a time of 9.63 seconds, setting a new Olympic record for that distance and defending his gold medal from the 2008 Beijing Summer Olympics. He was followed by fellow Jamaican, Yohan Blake, who won silver with a time of 9.75 seconds. PFP Sports and Celebrity Talent Agency is a speakers bureau and top booking agent for Olympic speakers, athlete appearances and endorsements. If you would like hire Usain Bolt or Sanya Richards Ross for a speaking engagement, appearance, endorsement, autograph signing or special event, request Usain Bolt speaker and Usain Bolt agent information from PFP Sports and Celebrity Talent Agency. For more information call 800.966.1380.